A Prince George’s County man contacted A Miner Detail on September 26 stating that he is “seriously considering challenging Gov. Hogan” in a Republican primary. No state Republican of note has indicated they intend to mount a challenge against Hogan. A Miner Detail pressed Devine on whether he was interested in challenging Hogan in the primary. 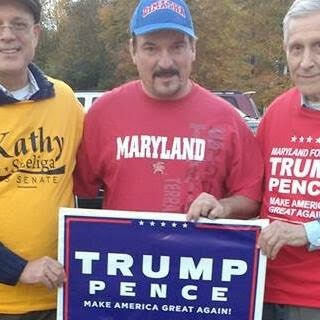 There are many Trump supporters in Maryland that are very upset with Liberal Larry as we call him. This may sound crazy to you but I know of a few people including myself that might just be able to beat him in the primary. However, winning the Republican primary would be the easy part. As a Trump supporter, winning the General would be the problem. A Miner Detail requested Devine provide a mathematical path to victory over Gov. Hogan in a Republican gubernatorial primary. I was on an elected Town Council and ran for Prince George’s County Council in the early 2000’s. I have a small Cleaning Company. Also work Part time with Coca-Cola and Uber. Devine’s personal Facebook account, which is currently public, is a running stream of insults against Democrats and Larry Hogan and supportive of President Donald J. Trump. Devine did not indicate when he plans to launch his campaign. He has not filed his candidacy with the Maryland State Board of Elections.